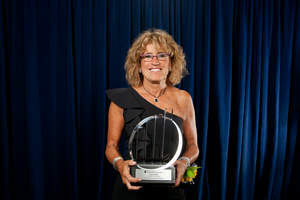 BOSTON, MA--(Marketwired - Jul 9, 2013) - Cool Gear International, the leading global designer and manufacturer of innovative hydration and food storage products, today announced that Donna Roth, Cool Gear Founder and CEO, received the Ernst & Young Entrepreneur Of The Year® 2013 Award in New England. The award recognizes outstanding high-growth entrepreneurs who demonstrate excellence and extraordinary success in such areas as innovation, financial performance and personal commitment to their businesses and communities. The finalists and winners were selected by an independent panel of judges and honored at a gala event at the Renaissance Waterfront on Wednesday, June 26, 2013. "This honor is not only for me but also for my entire company," said Donna Roth, President and CEO of Cool Gear International. "It's a tribute to the effort and contributions of the entire Cool Gear team." Now in its 27th year, the Entrepreneur Of The Year Program has honored the inspirational leadership of such entrepreneurs as Howard Schultz of Starbucks Coffee Company, Arthur M. Blank of AMB Group, LLC (The Home Depot, Atlanta Falcons), Pierre Omidyar of eBay Inc., Ruth Fertel of Ruth's Chris Steak House, Maxine Clark of Build-A-Bear Workshop, Inc., Tom Adams of Rosetta Stone, Reid Hoffman and Jeff Weiner of LinkedIn, and 2012 winner Hamdi Ulukaya, founder of Chobani Inc.
As a New England award winner, Roth is now eligible for consideration for the National Entrepreneur Of The Year 2013 Award. Award winners in several national categories, as well as the National Entrepreneur Of The Year Overall Award winner, will be announced at the annual awards gala in Palm Springs, California, on November 16, 2013. The awards are the culminating event of the Ernst & Young Strategic Growth Forum®, the nation's most prestigious gathering of high-growth, market-leading companies. Founded and produced by Ernst & Young LLP, the Entrepreneur Of The Year Awards are nationally sponsored by SAP America and the Ewing Marion Kauffman Foundation. In New England, local sponsors include RBS Citizens, True Capital, WilmerHale, Nixon Peabody, R.R. Donnelley, Scherzer International, Silicon Valley Bank, Murray Devine, Bingham McCutchen, Empire Valuation Consultants and Goodwin Procter LLP. Since 1986, Cool Gear International, Inc. has served as the leading global designer and manufacturer of innovative hydration and food storage products. With headquarters in Plymouth, MA, Cool Gear International's talented and trendy staff delivers high-quality products at a great value. For more information about Cool Gear International, please visit www.coolgearinc.com. Ernst & Young's Entrepreneur Of The Year is the world's most prestigious business award for entrepreneurs. The unique award recognizes the significant contributions of entrepreneurs who inspire others with their vision, leadership and achievement. Ernst & Young LLP's Strategic Growth Markets (SGM) practice guides leading high-growth companies. Our multidisciplinary team of elite professionals provides perspective and advice to help our clients accelerate market leadership. SGM delivers assurance, tax, transactions and advisory services to thousands of companies spanning all industries. Ernst & Young is the undisputed leader in taking companies public, advising key government agencies on the issues impacting high-growth companies and convening the experts who shape the business climate. For more information, please visit us at ey.com/us/strategicgrowthmarkets, or follow news on Twitter at EY_Growth. This news release has been issued by Ernst & Young LLP, a client-serving member firm of Ernst Young Global Limited operating in the US. Cool Gear International President and CEO Donna Roth Named Ernst & Young Entrepreneur Of The Year 2013 Award Winner in New England.